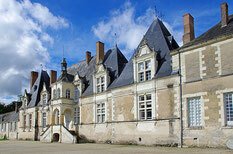 "Hidden treasures of the Loire Valley"
Everyone to the countryside! 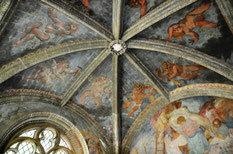 Less than 2 hours from Paris, come enjoy the peace and beauty of nature in Sologne. In the Loire Valley, even the paths to discover heritage sites are green, so that's decided then, this weekend we're all going to be surrounded by nature and grass, your walking companion will be delighted! 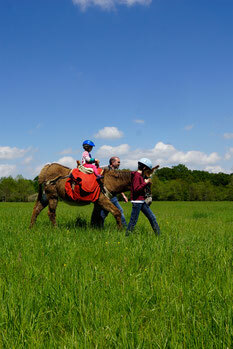 Hiking with a donkey in Sologne, a complete change of scenery without traveling to the other side of the planet! Along paths and trails lined with hawthorn bushes, you'll be charmed by the lushness of nature the sweet scents of the meadows and the forest floor. 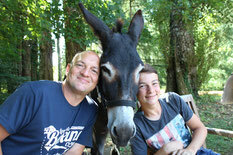 Blackberries, wild strawberries and cuckoo flowers will delight your children (and your donkey!). A charming outing proposing a subtle blend of forests, vines, large ponds, period dwellings ... just take it easy, at your donkey's pace. 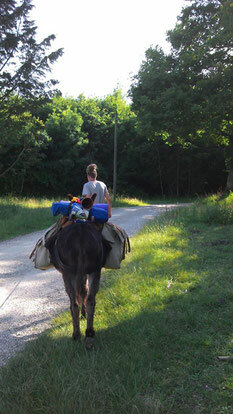 > Meet your walking companion: getting him ready, brushing him, putting the packsaddle on the donkeys back, itinerary explanation and first lessons about how to drive your donkey. 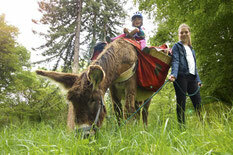 > Departure for the hike: "Blend of nature and culture"
Your donkey will take you to the Cheverny forest along a little grassy path lined with hundred year old oak trees. If you keepyour eyes open and look down the lanes, you might just spy a doe, a stag or a wild boar. With your small handbook explaining animal tracks and footprints in the forest, your children will have fun finding and recognizing the prints of a fawn, a duck, or a fox!! Along a pretty path lined with blackberry bushes, a glade is home to a small 16th century castle, ... beside a heather bordered track a heron spotted in the middle of a big pond, vines hiding a winery just behind. 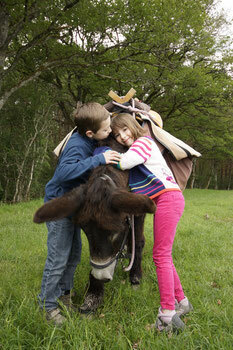 Let your donkey be your guide and make the most of every special moment, you'll lose track of time. Time for a picnic between the oak trees and the rushes, the trek continues on paths that are closed to traffic and only accessible on foot. A tiny path, a letterbox means there must a house nearby. How can that be possible? We're in the middle of nowhere! 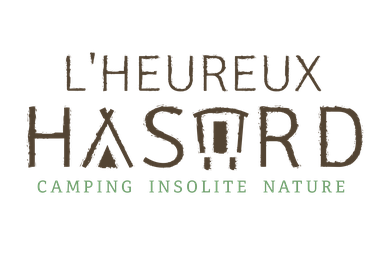 Maryse and Laurent are waiting for you in their guest house where you'll feel at home and where children will find everything they need to have lots of fun! "Looking for the ghost in the castle"
All good things come to an end, its time to leave and move on to Villesavin castle. Look up and give your imagination free reign, the path features "trees with expressions" ... then little by little you'll see the village of Tour en Sologne appear. You can begin your visit of the castle, but don't forget to solve the 14 riddles to find the ghost that haunts this castle. 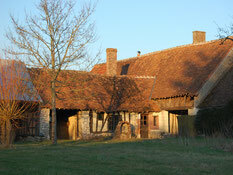 > A very pretty and typical house in the Sologne style ion a 23 hectare property. 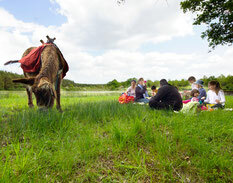 > Day 2: picnic lunch (sandwiches can be ordered at the castle in Villesavin). + 1 extra day: "on the farm"
Now, all you just to do is to pack your bags ... 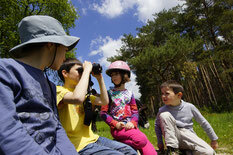 Here are some tips and practical advice to prepare your hike.